Oops – here is the screenshot omitted from my previous post. Would like a feature where i can integrate email-conversations in goals. This to use as an internal tool while working on projects. Any possibilities? Now I copy / paste different subjects, but would be great to go back and look at the exact conversation. If you use a web email client like Gmail or Hotmail you can link to the URL of a specific email in your Notes on any goal. If you are working in a team on a shared project you may have encountered an issue where someone sends a single email to many recipients that covers several different areas of concern (not all of which will be relevant to everyone on the To list). This causes split tracks, where lots of different different people Reply All, each covering a specific aspect. This leads to confusion and can make some people miss parts of the multi-strand conversation that are important to them. The web application Goalscape Connect is the ideal solution to this problem. Not only can everyone involved access and update the shared online project, there is also a Goal Chat facility: per goal Instant Messaging with inline attachments and email notifications. This means that Chats (and email threads generated from Chats) are always about a single aspect of the project. And you can select for email notification only those people who are concerned with that goal. So this immediately clarifies communications. When someone receives an email notification they can Reply to that email: their message will appear as a Chat on that goal and the others in the email notification list for that goal will receive a copy. And the emails contain a link to the goal, so anyone who wants to see the context for the email can click it and go to the goal in Goalscape Connect to see its parent and neighbours – and of course the Chat history on that goal is an archive of all previous discussions on that goal. 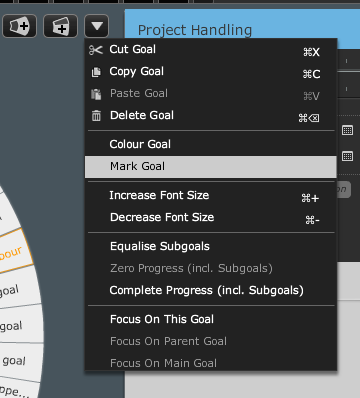 So as well as supporting all the goal management functionality for a project, Goalscape Connect also acts as a "visual filing system" for all your emails on that project! See also the attached 'Goalscape Connect summary' PDF. I noticed a message from you in our spam filter but when I went to restore it, it had disappeared. Please could you re-post it here or, if it is about a different issue or suggestion, create a new discussion for it. PS You can avoid your messages being misidentified as spam in future by creating an account on this forum, just click the 'Create a Profile' link at the top of every page. When you complete your Goalscape Forum registration and log in, you will be able to see a list of all your discussions (as well as being able to access all the public ones posted by others).